Zero Flicker-technology: no sync loss or "flickering"
1.Make sure that it's fully charged before using. 2.The movie must be 3D (up-down mode or left-right mode). And the projector needs to be adjusted into 3D-mode. 3.Stay in a signal-covered area. 4.Press "POWER" button to retest 3D signal. 【Exquisite Design】 Stylish design and super lightweight. Foldable and flexible bracket, suitable for all age groups and offering you a comfortable wearing experience. Broad frame blocks external light and reflections provides deep depth 3D image. 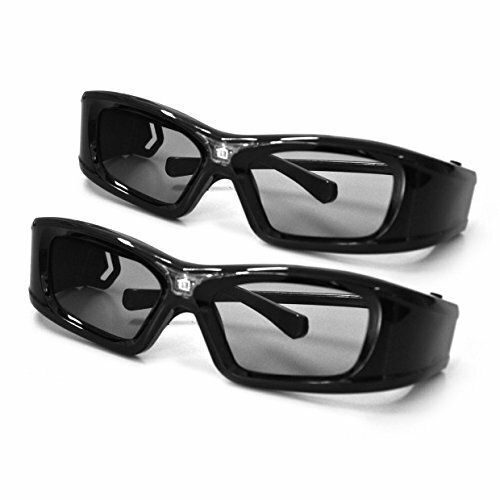 【Compatibility】 Compatible with all and ONLY 3D DLP link projectors. Imcompatible with TV. Tip: optimized for 3D Projectors only, not for TVs. 【Long Battery Life】Excellent rechargeable battery. Quick charging and long battery life. 2 hours charging for 50 hours use. 【Automatic Detection】 Automatically standby, auto-on and auto-off. Easy to operate. Suitable for all age group. Easy operation.